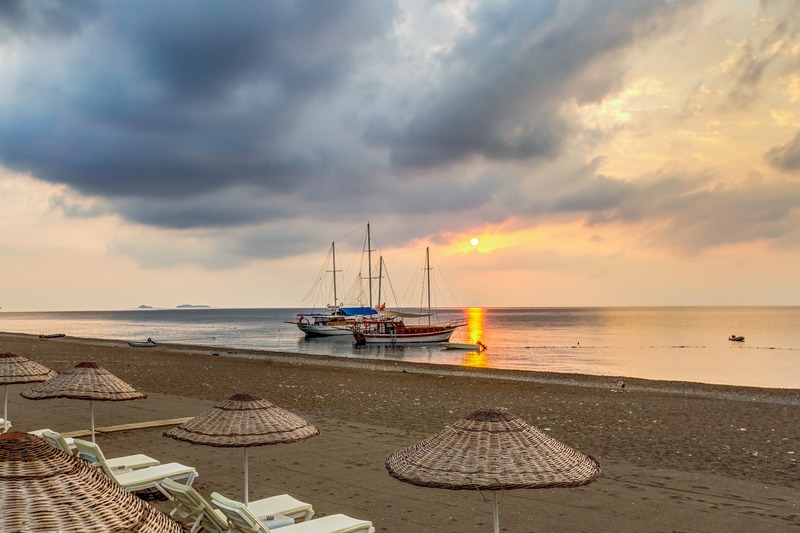 The Beach of Cirali: Cirali-Olympos beach, 3,5 km long beach with its calm and transparent sea is a safe and quiet environment for swimming and sun-bathing. They are a few restaurants and snack- bars on the sea front offering deck-chairs and umbrellas. A large part of the beach remains quite deserted except on a few summer week-ends . The seashore of Cirali has been designated as a protected natural area, the beach is one of the major nesting sites in the mediterranean coastline for the caretta sea turtle, an internationally endangered species. The sea turtles come every year from May to September to lay their eggs in the sand. The beach has recently been awarded a blue flag. The ancient city of Olympos Olympos, Walking 15 minutes to the south end of the beach, you will find the entrance to the ruins of Olympos located in spectacular natural settings. This ancient city has a rich and enigmatic past of rising and falling civilisations dating back as far as 200 BC when it was an influencial Lycian province. Along both sides of the river, you will discover hidden amidst the lush undergrowth vegetation the ruins retracing its fascinating history (Lycian tombs, ruins of a Roman theater, baths, bridte and a basilica). Climbing the cliffs and overlooking the sea, you can contemplate the breath-taking panorama from the ruins of Byzantine fortifications. Chimaera the eternal fire North of the bay, climbing 20 minutes up a path into the cliffs you will reach this striking geological site where a combination of gases escaping from cracks in the volcanic rocks produce continuously burning flames on the flank of the mountain. This mysterious natural phenomenon was the source of the original olympic flame and has also inspired many myths and legends, including the famous tale of Bellerophon and Khimeira the fire-breathing monster told by Homer in the Illiad. The mystical atmosphere is best experienced at dusk as the bright flames contrast with the dark surroundings. The ruins of a roman temple and a Byzantine church confirm the importance of this site as a place of cult. A steeper walk 20 minutes further up the mountain will lead you to a second area of flames where the panorama is magnificient. Local wonders & Activities The neighbouring coast once home to the ancient Lycians is an open air archeological museum with many interesting sites located in a beautiful and unspoiled landscape easily accessible from Cirali We can help you organise day visits to Phaselis an important Harbour of the Antiquity, Myra-Demre famous for its unusual funary architecture and the original church of Saint-Nicholas For those who enjoy walking, the area offers plenty of opportunities for short or longer treks to experience a full taste of the local natural beauty and wildlife and discover remote historical sites. The ‘Lycian way ‘ running from Antalya to Fethiye and passing through Çıralı is a recent project which has marked trekking paths (over 500km) retracing the ancient roads accross the hills and the bays. We can happily do the guiding for the treks as well as provide you with information on the signposted routes. Mount Moses (Musa Dağı 750m) is a 3 hours walk from Cirali (Çıralı). The ruins near the summit have recently been investigated by an archeological team and identified as the original city of Olympos. The summit of Mount Olympos (Tahtalı Dağı 2360m) is a good challenge for the more adventurous and experienced . It is a 6 hours trek through beautiful surroundings including a magnificient ceder forets. The view from the summit (locally nicknamed the Balcony of Antalya) over the whole region is unique. Practical Facts on Cirali Luckily, Cirali´s protected status has spared it from major touristic developments, big hotels, discos and shopping fever. This small village with a population of 1000 inhabitants is mainly active in tourism (mostly family run guest houses) and in agriculture with its famous citrus and pomegranate groves as well as greenhouse vegetable production in the winter. There are four small grocery shops selling basic goods, a few gift shops .It is easy to get to the outdoor markets taking place twice a week in the neighbouring area. There are a few places you can rent a car from and a bus service running between the village and the main road. CLIMATE The region is endowed with a warm mediterranean climate guaranteeing months of sunny weather. The ideal swimming season starts in April and ends in November. Spring and Automn can be surprisingly hot in the day but evenings tend to be quite cooler. Summer is for those who love hot weather with day temperatures above 35° C. Winters can be rainy but pleasant sunny days are abundant and temperatures very mild. Boat Tours Daily trips from Cirali ( Çıralı ) can be organised to explore the nearby coast and the beautiful creeks only reachable by sea. We also organise a tour around Kekova, the ancient sunken city.